The unique Nex Flow RIGID FLEX Hose is an all stainless steel hose that does not break after a few bends like rubber hoses with simple copper inserts. It is resistant to creep and crimping. Its all stainless construction allows for use in any difficult environment. The product consists of the flexible but rigid internal stainless hose and is covered in an additional stainless cover to provide it with strength to withstand high pressure. The connections at each end are welded to create a solid, high quality system. The Nex Flow RIGID FLEX Hose is used to flex, direct and then hold in place air nozzles, air jets and other small blow off products such as our Model 40001 adjustable air amplifier and 3” X-Stream Air Blade Air Knife. The RIGID FLEX Hose can also be used with liquid spray jets as it can handle a pressure of up to 1600 PSIG! Regular rubber hoses with copper inserts can be bent into usable shapes maybe 5 times and then they will break. The RIGID FLEX Hose can be “flexed” up to 100 times before wearing out offering long life and savings in material and downtime caused by replacement. 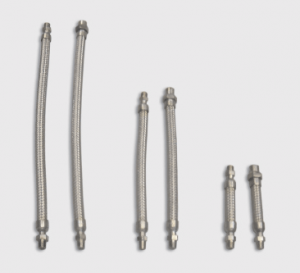 The rigid flex hose is available in three different sizes 6” (152 mm), 12” (304 mm) and 18”(457 mm) and in two configurations – 1/4″ male NPT welded end connection both ends or 1/4” male NPT welded connection one end and female NPT welded connection other end. Special lengths can be made to your specifications. 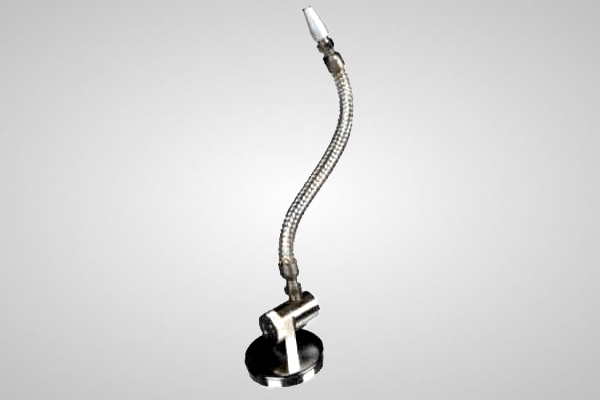 For a more secure directional setting of blow off products you can utilize the NexFlow™ swivels.